Jerry Curry's faith and determination allow him to overcome racial and social barriers to rise from private to general in the U.S. Army and to serve in the administration of three presidents. 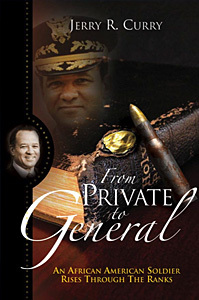 From Private to General is the exciting story of an American general who learned the real source of his power and authority. God’s sustaining power was at work in the life of Jerry Curry from his early days in the Pittsburgh Steel Foundry through the many adventures that would follow, leading him into the places of highest authority in the land. It is the story of a young man of mixed race who enlisted as a private at the age of eighteen and went on to become a general and after his retirement, to serve three Presidents. His tour of duty took him to Korea, Vietnam, Europe and Washington, and many places in between, where he faced great danger and challenge. Most importantly, it is the story of Christian convictions, faith, hope, and love. THIS BOOK IS THE WINNER OF A 2007 BRONZE IPPY AWARD FOR BOOK OF THE YEAR FROM INDEPENDENT PUBLISHER. Major General Jerry R. Curry is a decorated combat veteran who has also served as Deputy Assistant Secretary of Defense in the Carter Administration, Press Secretary to the Secretary of Defense in the Reagan Administration, and Administrator of NHTSA in the first Bush Administration. He has a B.A. from the University of Nebraska/Omaha, an M.A. in International Relations from Boston University, and a Doctorate from Luther Rice Seminary. He and his wife Charlene live on Bull Run Mountain in Northern Virginia. The Currys have four children, seven grandchildren and one great grandson. Jerry Curry is now a business consultant and opera singer.